The Wirecutter's singular goal is to decide which gadgets to buy or not to buy. Today, it takes a hard look at a portable GPS for wandering the bush. The Garmin GPSMAP 62s a great GPS for an outdoorsman/woman. Selling for around $499 RRP, it's a piece of gear that offers a balance of cost and features. When I was nine years old, I got lost in the woods for a night. To make up for it, I ended up spending over a decade as an army cadet and reservist, picking up some solid old-school orienteering skills along the way. I never got lost again. Not everyone who camps, hikes or works in the wilderness is emotionally scarred into learning how to survive outdoors like I was. For most people, owning a handheld GPS device is the best way to get from point A to point B. Which one should you buy? Up until last week, I couldn't have told you. I've never had much use for GPS. To educate myself on the topic, I started by talking to Tyler Barrass at the Mountain Equipment Co-Op in Victoria, British Columbia. I asked him a simple question: What should an average joe look for when he's shopping for a handheld GPS device? "You want to have an external antenna," Barrass explained. "With the old-style models with the antenna in the face, you pretty much had to hold it level. You'd never get a signal in the city where there's a lot of tall buildings, in canyons or thick foliage-you're not really going to get a signal at all. An external antenna fixes a lot of those problems. You don't have to hold it perfectly flat and you get a much better signal in covered areas". He also made it clear that I should look for a handheld that has both internal and external memory. This provides the option to install maps and data downloaded from your computer at home, as well as the ability to slap a MicroSD card into your GPS device that contains additional data like area-specific topographical maps, charts or city navigational data. Outdoor Gear Lab echoed much of what Barrass had to say, and went on to recommend that if you're serious about finding your way anywhere, you'll also want to pony up the dough for features like a digital compass, a push button interface (because touchscreen-based GPS devices are slower to load, use more power and are harder to see in direct sunlight), and ensure that it's built to survive the environment you'll be using it in. The Garmin GPSMAP 62s has everything Barrass and Outdoor Gear Lab mentioned and more. Weighing in at 260g it's got enough heft that it feels solid when you hold it, but it's still light enough that jamming it in your hip pocket between uses is no big deal. It can run off of two AA batteries for up to 20 hours before they need to be swapped out. With 62s' backlit 2.6-inch colour transreflective screen, you'll have no problem figuring out where you are night or day, even in direct sunlight. Its rugged, waterproof case protects it from the elements as well as the occasional case of the dropsies. It has a well-designed eight button and directional pad interface, any of the GPSMAP 62s's functions can be accessed with one hand. It's got an external antenna, which gives it better chance to receive GPS data when you're navigating under thick tree cover, heavy snowfall or walking along the bottom of a canyon than a handheld equipped with an internal antenna. With 1.7GB of internal memory and a MicroSD slot, you'll be able to upload navigational data from your computer or slap a memory card pre-loaded with mapping information into the GPSMAP 62s while you're out and about. It even has a barometric altimeter baked into it to ensure more accurate elevation readings. The GPSMAP 62s's onboard software puts the handheld's hardware to excellent use. The device supports topographical maps, subscription-based satellite imagery and BlueChart g2 marine navigation. With the purchase of a Garmin City Navigator NT pack, the GPS 62s can be used for turn-by-turn navigation. Thanks to the company's Custom Maps software, you can even scan paper maps and upload them to the handheld. The device's internal memory is capable of storing 2000 waypoints/locations, 200 different routes and a 10,000 point track log with up to 200 different tracks. In short, it's got pointing you in the right direction covered. Garmin's also gone through the trouble to include a few extras to make getting where you're going as enjoyable as possible: paperless geo-caching, tide tables, a hunter/fishing calendar, outdoor GPS-based games and the ability to enter customised point of interest information are all standard features. GPS Tracklog ate the Garmin GPSMAP 62s up with a spoon, saying "The Garmin GPSMAP 62s brings a long-awaited update to the fabled and much-loved GPSMAP 60CSx, which has reigned supreme as the gold standard handheld GPS for more than four years... the 62 series models are some of the best handheld units available today". It's a sentiment echoed by the New Zealand-based map merchants at MapToaster. Their review of the GPSMAP 62s was close to two years old, so I contacted them via email to make sure they still felt the same way about the device. MapToaster's John McCombs replied that "The 62s is still a good pick", and that for heavy duty outdoors use, it's a great choice due to it's durability, and how well it operates under dense canopy. Even the picky survivalists at Apocalypse Guide felt that the 62s hit a sweet spot, saying "The cheaper Garmin GPS tracking units just don't have enough of the necessary features and benefits, and you end up paying for unnecessary'bells and whistles' with the more expensive units. We found that the Garmin GPSMAP 62S Handheld GPS Navigator is the "goldilocks" of the Garmin GPS devices — not too little, not too much... just right"! As much as I like the Garmin GPSMAP 62s, there were a few things about it that annoyed me. For starters, you'll have to remove its batteries anytime you want to swap out MicroSD cards. While the handheld's buttons make navigating through the device's menus and options a breeze, they're a pain to use if you need to enter any text, like labelling a waypoint, for example. It's worth mentioning that while you can see the screen in direct sunlight, the GPSMAP 62s's crummy 160 x 240 pixel resolution can make maps look a little jagged and normally lush satellite imagery appear downright fugly. It's also a little pricey, especially if you're not planning on going for a hike any more than once or twice a year. Most smartphones these days carry a GPS receiver as a standard feature. iPhone users can download GPS Kit for $10.49. If you own an Android handset, you can download BackCountry Navigator PRO GPS for $US11. Either app will let you do some pretty basic navigating away from civilisation, with pathfinding must-haves like route planning, waypoints and the in-app purchase of additional maps. I'd recommend against it though. Your smartphone isn't designed to take a beating, and it's likely not waterproof, although you can get a good case for it. What's more, if you plan on taking a longer trip, you'll have to bring along the means to recharge your battery. With the GPSMAP 62s's rugged build and 20 hours of use from a set of easily replaceable AA batteries, such quibbles are a non-issue. Speaking of longer trips, the Magellan Explorist 710 might be a good choice for anyone planning an adventure away from home for an extended period of time. The Magellan Explorist 710 weighs about the same as the GPSMAP 62s and matches it almost feature for feature-except for a couple of things: the Explorist 710 has 8GB of internal memory to the GPSMAP 62s's 1.7GB. That's more than enough room for all of the maps and data you could ever need. Unfortunately, the Magellan only gets 16 hours of battery life — six hours less than the Garmin handset. 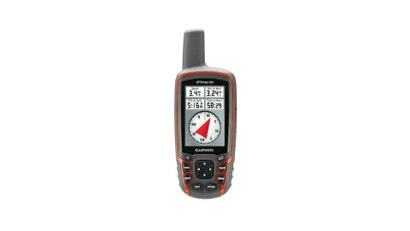 $649 RRP — $150 more than the GPSMAP 62s. Garmin makes other stuff too. Take the Oregon 550 for example. For $649 RRP, you get waterproof handheld GPS device with a built in barometric altimeter just like the one in the GPSMAP 62s. It's got a larger, higher resolution display than the 62s has, which makes maps look great, and easier to see when you're using the handheld in the car as a turn-by-turn navigator. If you're not thrilled with the GPSMAP 62s's button driven interface, you'll likely love the Oregon 550's touch screen but touch screens don't like wet hands, generally. Unfortunately, more screen real estate means more drain on the battery. The Oregon 550 only gets a maximum of 16 hours of battery life. If that's not enough to dissuade you, the Oregon 550 also has an internal antenna, which means it's reception won't be as great the GPSMAP 62s. If you like the look and feel of the GPSMAP 62s, you could also go down a model in the GPSMAP 62 line, but I wouldn't. The Garmin GPSMAP 62 is just as tough as the 62s, but costs roughly $100 less. That extra cash buys you the GPSMAP 62s's built-in three-axis compass, which makes it easier to get an accurate reading of your geographical location. My advice is pick up the Garmin 62s and try it's basic map functionality on for size. Why buy more than you really need?